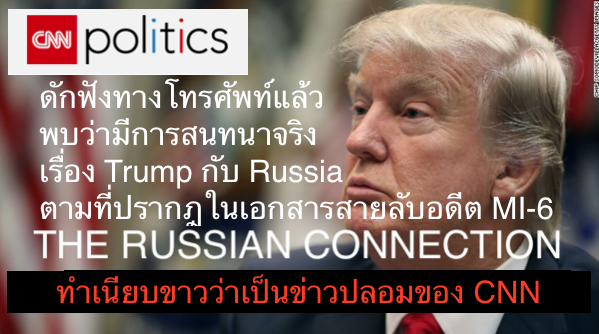 เนื่องจาก Trump เป็นคนนิยมใช้ความเท็จในการสร้างความจริงแบบทางเลือกใหม่ (Alternative Fact) การพูดความจริงกับความเท็จโดย Trump จึงสับสนตลอดเวลา เรื่องความสัมพันธ์ระหว่าง Trump กับ Putin / Russia ถูกเปิดเผยในเอกสารลับ 35 หน้าโดย BuzzFeed.com และกำลังมีการสืบสวนหาข้อเท็จจริงตามที่ปรากฏในเอกสารนี้ การทำงานของหน่วยจ่าวกรองสหรัฐทำต่อไปอย่างเงียบๆ พร้อมๆกับสื่อมวลชน โดยที่ Donald Trump เองก็ทราบดี เรื่องนี้เป็น 'หอกข้างแคร่' ที่คอยทิ่มแทง Trump อยู่ตลอดเวลา ซึ่งขณะนี้เขาได้กลายเป็นประธานาธิบดีสหรัฐฯไปแล้ว หากความจริงเปิดเผยออกมาเมื่อไร ก็จะถึงเวลาวิกฤติของ Trump ในตำแหน่งประธานาธิบดีทันที. But the intercepts do confirm that some of the conversations described in the dossier took place between the same individuals on the same days and from the same locations as detailed in the dossier, according to the officials. CNN has not confirmed whether any content relates to then-candidate Trump. The corroboration, based on intercepted communications, has given US intelligence and law enforcement "greater confidence" in the credibility of some aspects of the dossier as they continue to actively investigate its contents, these sources say. Spicer later called back and said, "This is more fake news. It is about time CNN focused on the success the President has had bringing back jobs, protecting the nation, and strengthening relationships with Japan and other nations. The President won the election because of his vision and message for the nation." Some of the individuals involved in the intercepted communications were known to the US intelligence community as "heavily involved" in collecting information damaging to Hillary Clinton and helpful to Donald Trump, two of the officials tell CNN. One of the officials stressed to CNN they have not corroborated "the more salacious things" alleged in the dossier. Trump dismissed the entire dossier last month during his only news conference as President-elect, saying in January, "It's all fake news. It's phony stuff. It didn't happen." 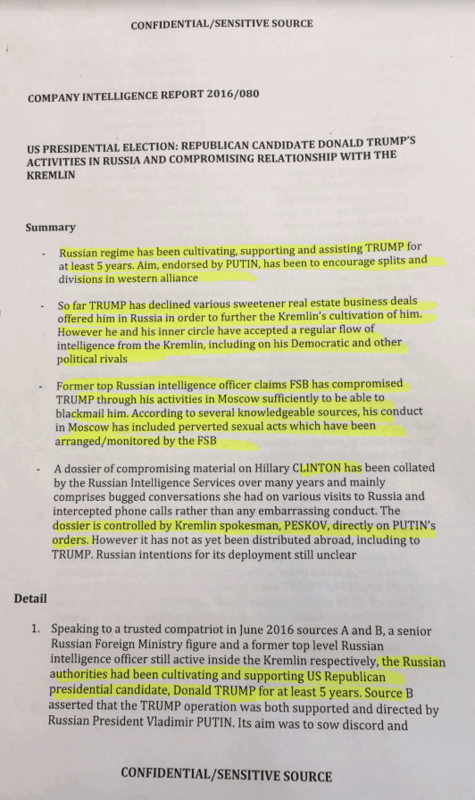 The dossier was commissioned as opposition research by political opponents of then-candidate Trump and compiled by a former British intelligence agent. US intelligence agencies checked out the former MI6 operative and his vast network throughout Europe and found him and his sources to be credible.CNN's Pamela Brown and Marshall Cohen contributed to this story.